You.DJ is a fully-featured music DJ service that combines the incredibly large musical database of SoundCloud and mixes it with the modern cloud based architecture that enables anyone to create, edit, and mix songs easier than ever before. By focusing on slick interface, easy to use DJ controls and a lot of technical wizardry, You.DJ definitely represents one of the best online destinations for creating fascinating electronic music today. The ultimate online DJ mixer software from Browser! You.DJ has access to over 20 million tracks, DJ decks are incredibly easy to use, helpful community is there to help you with whatever problem you have, your creations can be shared to your favorite social network with only few clicks of your mouse. Visit You.DJ and see for yourself the wonders of electronic music creation that is coming directly from your browser window. What you got is a traditional DJ setup : 2 turntables and a mixer. Your mission is to play simultaneously two songs on each turntable and to use the mixer to mix them together. To spice up your mix, you can use effects such as the loops, the fx pads, the eq, the scratch... To make it easy, the beats are automatically in sync and you can also change the speed of the music by clicking on the bpm value on top of the mixer. You can access to all the music and videos on the bottom side. The menu on the left side, allows you to search and to navigate into the music library. Also you can display awesome videos in the background by pressing these buttons on the mixer. Today when computers have become perfect platform for making electronic music and mixing songs, number of DJs form all around the world has increased to incredible levels. However finding the best tool for mixing music is not easy even today. Some programs are large and cumbersome, some don’t allow portability and syncing between devices, and some are complicated for novices. The ultimate online DJ mixer software from Browser! One of the best web apps for easy DJ mixing is You.DJ, a music application that has managed to integrate great DJ tools into 20 million song library of SoundCloud. No restrictions, no waiting, all delivered to you for free directly in your Firefox, Safari, Opera and Chrome browsers. Being a DJ is an easy job today when everyone has easy time accessing dozens and dozens of professional music tools directly from their browser, but what can you do when you want to simply mix you musicwithout difficult tools and access to millions of songs that were created by some of the best artists from all across the world. Solution for that problem is You.DJ, an easy to use but powerful mixer that gives you just the right amount of tools and features to make your music creation process as streamlined as possible. You.DJ features two mixing boards, with all the tools that will make DJ’s feel like at home. Below mixing gear that takes just a small part of your screen, you can access list of songs taken directly from one of the most popular audio distribution platforms – SoundCloud. More than 20 million songs are available for your streaming and mixing purposes, with integrated tools for easier searching - search by name, Hot Songs, Recordings, Favorites, Online DJs (who are making music at this moment), and folders filled with songs from popular electronic music genres. 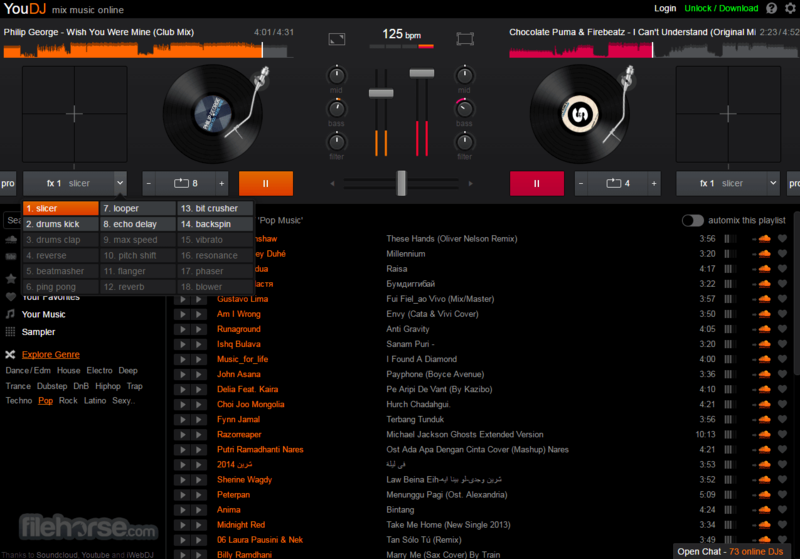 The ultimate online DJ mixer software from Browser! No matter where you are, if you have access to an internet connection, you can access You.DJ via your PC and Mac browser, instantly putting your DJ skills into use and making great music for your friends, family, public and internet audience that can see what songs are you currently using. Interface of You.DJ is very simple. 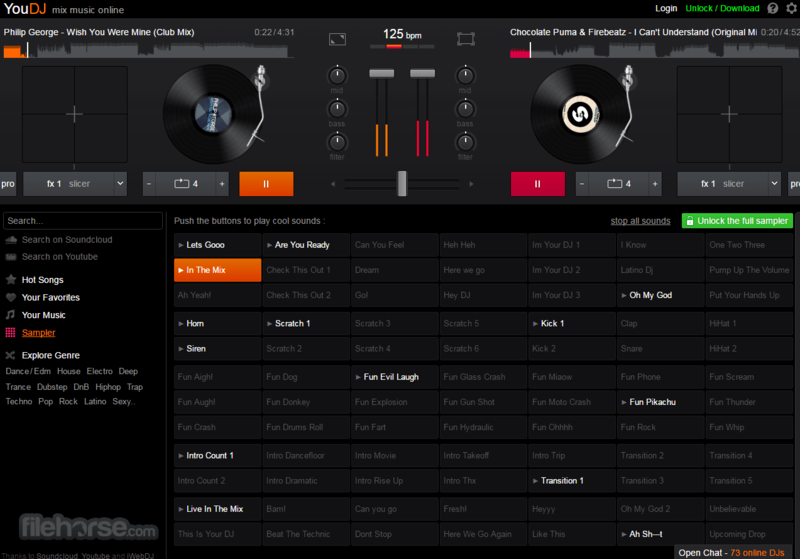 You have access only to its main page that hosts simple DJ tools, and lists of songs from SoudCloud. Listing options for songs are easily manageable, with integrated search options if you want to search by song keywords. 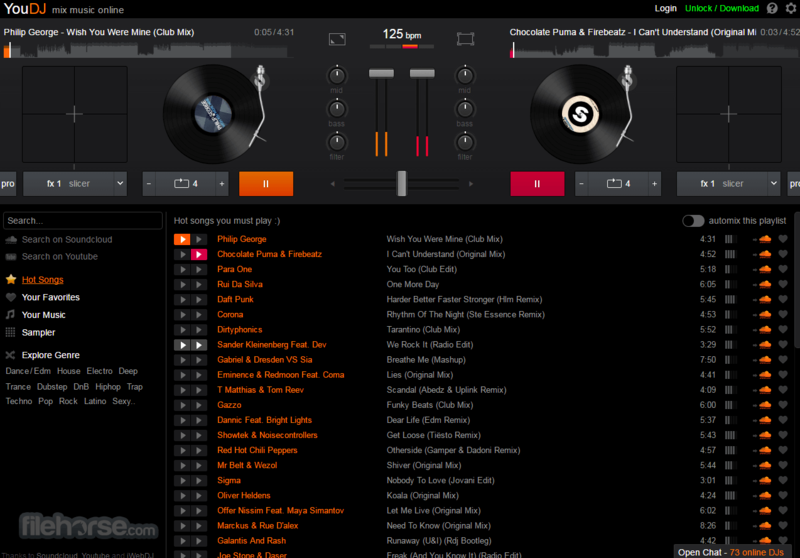 In addition to website interface, You.DJ can be also accessed directly from Chrome via fully functional browser extension. You.DJ offer all of its services for absolutely free, with a goal to expand its user base as much as possible. You don’t even have to create new account to use You.DJ. If you want to easily mix music no matter where you are, You.DJ represents one of the best cloud-powered tools you can find. Free, unrestricted and extremely portable.